Link's legendary weapon awaits players demonstrating strength and determination. The Legend of Zelda: Breath of the Wild handles weapons a lot differently than past titles in the series: namely, all swords break through use, which means smart players will always be on the lookout for their next epic weapon. And speaking of epic weapons, the game wouldn't be much of a Zelda title if it didn't feature the Master Sword, the legendary blade whose fate is bound to that of the Hero of Time. Fear not, for the Blade of Evil's Bane does indeed make an appearance within Breath of the Wild. Read on to learn where to find the Master Sword. Where Can The Master Sword Be Found? The Master Sword wouldn't be much of a legendary relic if it was kicking around in some dusty chest in the middle of nowhere, and as could be guessed, the sword has a fittingly formal resting place. Players who want to find the sword naturally will have their chance during the main quest called Captured Memories, which recounts the story of Link and Zelda before the calamity. Of course, there's nothing stopping players from seeking out the Master Sword whenever they like. In that case, adventurous weapon-seekers will want to look to the North to the Great Hyrule Forest, wherein they must brave the Lost Woods in order to find their prize. Zelda fans already know the primary obstacle they'll face in the Lost Woods, but for everyone else, the essential information lies within the name: the Lost Woods, simply put, is very difficult to navigate. No worries, though, because Shacknews has posted up an excellent video tutorial that will help worthy heroes find their way through the forest's mystical maze. 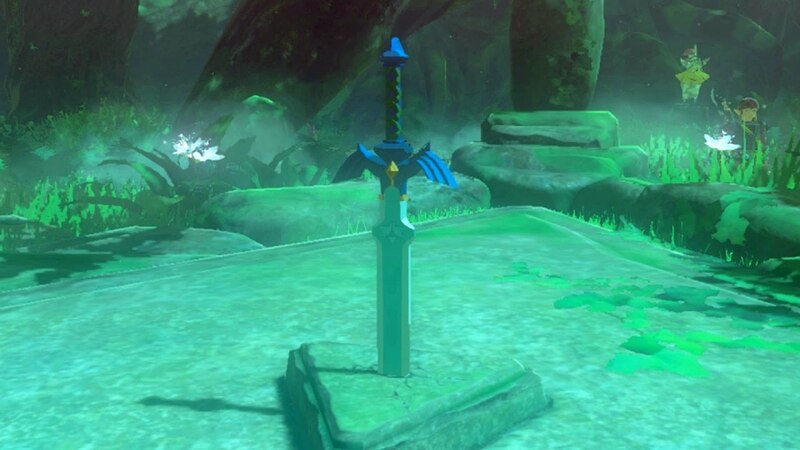 Once the Lost Woods have been navigated, players will find the Master Sword sitting in a stone pedestal beneath the Great Deku Tree. Eager players will want to pull the sword from the stone immediately, but Breath of the Wild's legendary weapon won't give bestow its power upon any garden-variety hero. No, the Master Sword requires a warrior as strong as Zelda's legendary Champion, and will test the might of any hero who attempts to remove the blade by draining their health. The first time Link tries to pull the blade from the pedestal, he will likely fail, and the Great Deku Tree will warn him just before he dies. Any attempt made after that will likely end in death unless the player has at least 13 hearts. When trying to remove the Master Sword, players must continue to pull until nearly all of their health is drained, but right before the 13th heart depletes entirely, the sword will pull away freely. The Legend of Zelda: Breath of the Wild's weapon system will leave many wondering: does the Master Sword break? Well, yes. All weapons in the game do. However, the Master Sword has a special property that makes it return to the player's inventory after a certain amount of time has passed after it breaks. Durability aside, the Master Sword does have a few unique properties that make it more than worthy of player's time. Firstly, the weapon has an attack power rating of 30, and generally above-average durability. However, players who bring the Master Sword along to the Hyrule Castle grounds in order to defeat Calamity Ganon will find that the sword's attack power has increased to 60, and becomes nearly unbreakable. Trying to stay warm? Looking to find a way to pass the time? Hit up our Legend of Zelda: Breath of the Wild guides to get the absolute most out of the game.